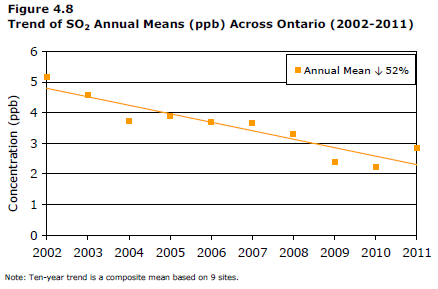 The Ministry of the Environment's backgrounder for it's "2011 Air Quality in Ontario Report" caught my attention with statements such as, "air quality has improved significantly over the past 10 years." This we knew already, but what about over the past year? I checked to see how 2011 compared to 2010. I did not spot any accomplishments there, which is notable because Ontario's coal-fired generation of electricity reportedly dropped from 12.6TWh in 2010 to 4.3TWh in 2011. The Ministry explains, "Emissions of NOx, CO and SO2 continue to decrease due in part to Ontario's air quality initiatives such as the phase-out of coal-fired generating stations." Transboundary emissions, mainly from the U.S., account for approximately half of Ontario's smog. I'm rather doubtful that this stat is ever revisited; it's quoted now as it always has been - but it's worth a review of what's happening across the border. 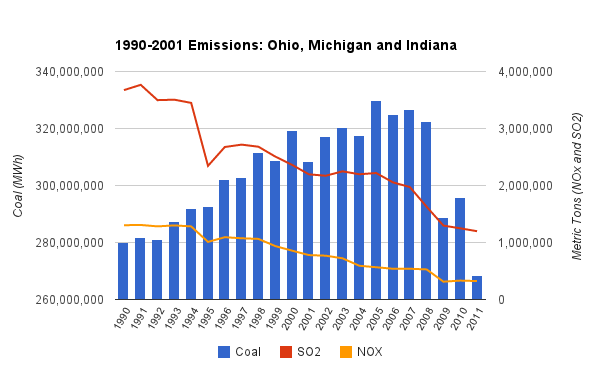 I revisited U.S. Energy Information Administration (EIA) data to see how emissions from the generation of electricity in Ohio, Indiana and Michigan (as I did in July 2011). 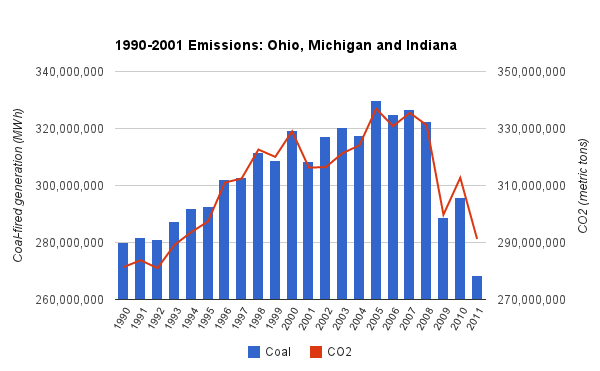 If there is one thing to be concerned about in this graph, it is that the trendy catchphrase that there is no such thing as cleaner coal has been halting the cleaning of the smokestacks that was addressing emissions up until 2009. Which isn't to say all the rumours about coal are ill formed. CO2 emissions in the states move in step with coal-fired generation. It is to say that many groups are choosing to lie about the ability to clean smokestacks in a Machiavellian campaign to reduce CO2 emissions. Last mіnutе editorіals arе alwaуs best, the content just pours out ontо the screen. You can create psp video game for PC, Linux, Mac, I-phone or I-pad. stuffed bunnies, stuffed raccoons, or even longer against a champion who was bred for the distance. brand new blank DVD s.